infection & was found to have very large bladder stones, which were removed..
puppy & was medically removed at that time. Having one-eye has not slowed her down a bit. Pong has recovered well from her surgery & was spayed at that time also. here to see Ping's details. Ping & Pong will be available for adoption possibly by the end of March or early April. Pong's sister Ping is all better. 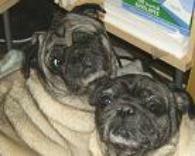 Pong & Ping are ready to be adopted in their forever home. Very friendly, gets along well with others. Receives cyclosporine eye drops 2 times per day for PK. Missing one eye. 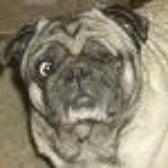 Active, loves to run with the other pug's and be where the action is.